June 2, 2016, 4:59 PM · Ayana Tsuji, 18, of Japan has won first prize and most of the Special Awards in the 2016 Montreal International Violin Competition. First Prize winner Ayana Tsuji. 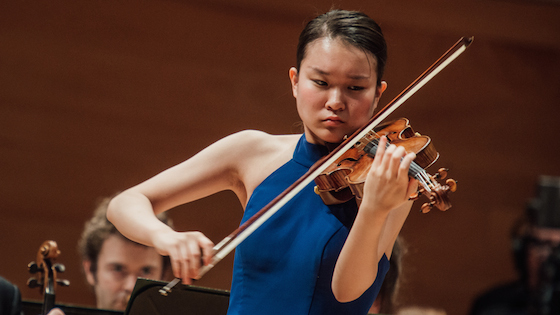 Photo by Tam Lan Truong, courtesy of CMIM. Ayana began studying violin at the age of three, won the First Prize at the Osaka International Music Competition in 2008, and First Prize at the 63rd Student Music Competition of Japan in 2009. Recently she was one of the 16 semi-finalists and was selected the best performance of the Paganini Caprices at the 2014 International Violin Competition of Indianapolis Second Prize(Top Prize) at the 11th Seoul International Music Competition in 2015. Ayana has performed with orchestras including the Nagoya Philharmonic, Tokyo City Philharmonic and Osaka Symphony Orchestra.. She currently studies with Koichiro Harada at Tokyo College of Music High School. June 4, 2016 at 07:04 PM · All three winners had excellent techniques and the ability to deliver accurate performances. I think the winner was the most outstanding. However, i was struck by how similar they all were - fast continuos vibratos and the same delivery and attack. What worries me most is that there was no individual musician who stood out with a personal interpretation. They all had commitment - but not the magic required to make a unique statement. But I admire their reliability and accuracy and the fact they gave their all. I was a little surprised that they all seemed to have a small sound - but there were no mic's for the soloists to be seen! Lots of mic's for the brass and the timps, as they are such quiet instruments, and plenty for the woodwind. So we can't have any clue as to who had a big soloistic sound, and I have a horrible feeling none of them had that BIG sound we associate with Russian players - to mention only them! June 4, 2016 at 09:22 PM · All three did make a big sound in the hall and were very good at projecting, actually. I was sitting pretty far back, in the balcony at the hall and was actually surprised how well they carried. There were occasions on which the orchestra started to cover the soloist in both Sibeliuses (Sibelii?) but those were loud overwhelming places in the music to begin with, and I'm not sure if the soloist was to blame there. June 5, 2016 at 08:51 AM · Thanks Laurie - it sounds like the TV people messed up again - and the players sure looked like they were making a big sound, especially Ayana Tsuji, who was really into it. We will have to keep an eye out for more performances, and I would love to hear them playing with piano, especially duo sonatas. They are mostly so young as well, which gives them plenty of time to mature and become really stunning musicians. June 7, 2016 at 05:59 AM · Thanks Laurie - I heard the Beethoven 6th sonata - certainly a big sound and her French fiddle has a really rich sound. Lovely playing, I hope she goes far, a big talent.